Competition in London is extremely high. Standing out in a city with more than 8 million people and over 1 million businesses can be tough. If you play your cards right, you can stand out from your competition and grow your customer base. This is why keyword research is vital to SEO. If you're a plastic surgeon in London for example, a valuable keyword that you'll want to rank for would be "plastic surgeon in london". This is a keyword with extreme monetary value. But it's also difficult to rank for and requires a lot of time and resources to take. Keyword research helps us uncover keywords with monetary value that our clients may not have thought of. 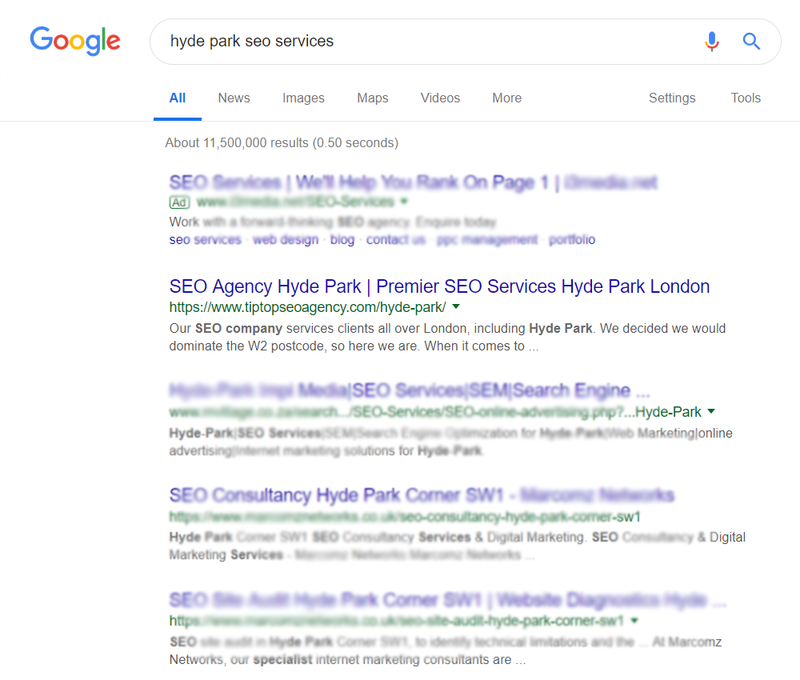 For example, we ranked our old website for Hyde Park SEO services. Hyde Park is a very popular park and postcode in London. People who live around this area are usually the type of people who can afford plastic surgery. Ranking for a keyword like plastic surgeon near Hyde Park would not be difficult for us to do, and could bring in an extra 1-2 patients every year. Keywords like this are easy to overlook, but doing so is costly. This is why keyword research is a core pillar to our London SEO services. Your website's user experience needs to be amazing. If you're a plumber and a large portion of your business comes from emergency repairs, a fast website is crucial. A potential customers boiler just broke down - in the middle of winter. They need to find a plumber near Marble Arch in London, so they hop onto Google. A quick Google search for a plumber in Marble arch and your website shows up on page one. If that customer then clicks onto your website, but your website takes too long to load - they will go back and find another plumber. We know how to rank in specific areas like Marble Arch. More importantly, our SEO services are designed to ensure that your potential customers have a positive experience when clicking onto your website. If your business is in a prestigious area like Mayfair in London, first impressions are everything. Your clientele and customer base may have a finer eye for luxury, which is why your website needs to look stunning. On page SEO relies heavily on the written word. But having a two thousand word article on your homepage may give off a cluttered feel. This is where our SEO expertise comes in. We're able to structure your on page in a way which won't affect appearance and turn off your potential customers. All this, whilst still maintaining our core pillar of on page and making sure that it's up to par with your competitors. We also know how to make this work with landing pages, and help you layout your pages in the best possible way to speak your message to visitors. 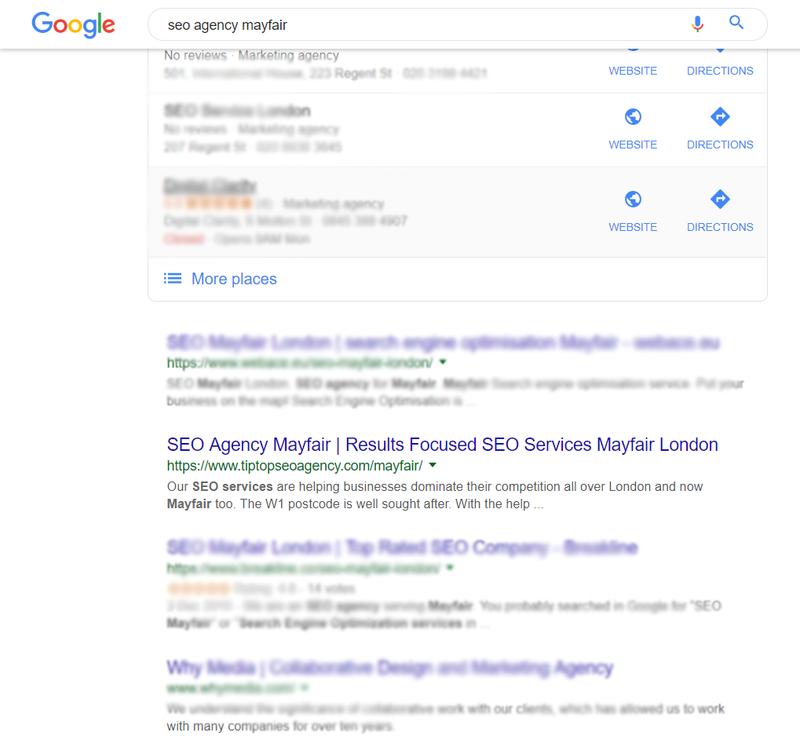 An example of this is our Mayfair SEO page, our old site ranks for SEO agency Mayfair. The page displayed is one which is simple and communicates directly to business owners who are savvy. Areas like Mayfair & Belgravia are the definition of upscale in London. Many people who can afford to live in areas like this will tell you that they got to where they are now by building relationships and providing value to people. We have the same frame of mind when it comes to off page SEO. Much like in life, the more powerful friends you have the more likely you are to succeed. This is no different when it comes to ranking on page one. The more popular and powerful friends you have, the more search engines like Google reward you. This is why link building is so important in SEO. Every website that links to your website is like a friend that you have a relationship with. The more powerful friends you have, the more search engines will deem your website to be trustworthy. We build these crucial relationships for you. London is a big city. We help businesses cover as many areas as possible in order to maximise organic traffic and revenue. There are people searching for a business in your industry every single day. These are ideal customers that are ready to buy. Our services are designed to make businesses more money. Increasing your sales and revenue is our core objective. We know that the only way we can grow our SEO agency, is by helping the businesses we work with grow and generate more revenue. The SEO industry is one of the fastest changing industries out there. We stay on top of algorithm changes so our clients succeed. We keep things simple and generate our monthly reports using Google Analytics & Search Console, no third party tools. Paying for advertising is an expensive game. As soon as you stop paying, the taps shut off and so does your stream of new customers. Nobody likes signing a long term contract. Our contracts are month-to-month because we know we can deliver results. Our clients dominate their competitors on Google. Working with us will give your company a competitive advantage. Clicks From Search is an SEO agency in London. However, because of the way we've setup our website, we can rank in multiple locations. This flexibility allows us to bring in more organic traffic than we could if we just focused on one city or region. If our strategy was strictly paid and we wanted to expand out into these same cities, regions and target different international keywords, our advertising spend would cut deeply into our profits. Once you're on the first page, you have a steady stream of traffic. Unlike paid advertising, the amount of money you invest in SEO should go down as you expand further and further. And the really amazing part about SEO is the fact that the amount of money it would take to generate a certain amount of traffic will always cost less than paid search. There are many examples that back up this statement. At Clicks From Search, because we offer pay per click advertising as a service, we know how expensive it can be for our clients. 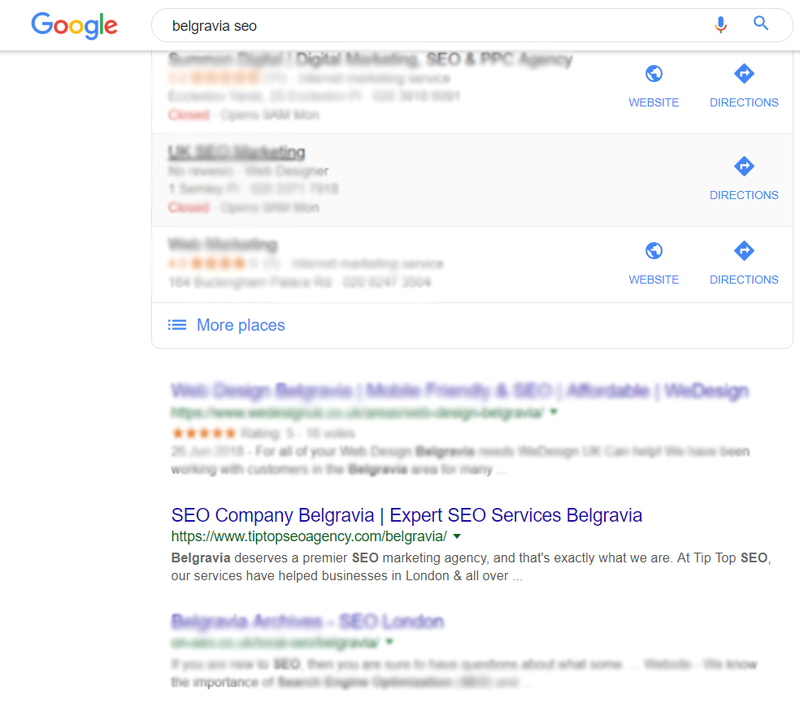 We're not saying that paid advertising doesn't work, but what we are saying is that your return on investment for every dollar invested into SEO is always going to be greater. The keyword "dentist in London" gets around 4000 searches per month in the UK. The cost per click for this keyword is around £4.50 on average. When running paid search ads, you can expect to receive anywhere from 5-10% of the total clicks depending on how well your ads are performing. At a best case scenario of 10% of the clicks, that's 400 clicks per month. That's an average of £1800 per month spent on clicks. Out of the 400 clicks, you'll probably generate around 40 leads, and you can expect to turn between 10-25% of these leads into paying customers. So that's between 4 and 10 new patients. Assuming each patient is worth £2000-£3000 over a 4-5 year period, that's a pretty decent return. Now let's take a look at organic traffic numbers. With organic traffic, assuming your website is ranking number one for the chosen keyword, you can expect to receive around 30-40% of the total clicks. Let's take 40% as the example which would leave us with 1600 clicks which is 40% of 4000 total for the keyword. Sticking to the same numbers, if 10% of the 1600 clicks turns into leads, that's 160 leads. Assuming again that between 10-25% of these leads will turn into paying customers, that's between 16 and 40 new patients. 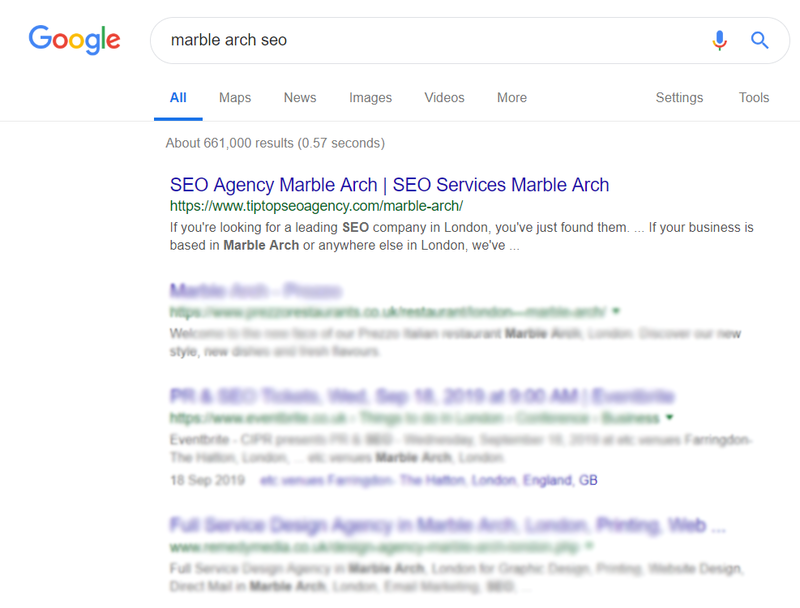 This would mean that you could invest 4 times into SEO (£7200 per month) what you invested in paid ads (£1800 per month) and SEO would give your business the same return on investment.